I once had a long but valuable exchange of views about 'type' with a Foxhound enthusiast and hound-show judge. For him, whilst conceding that he liked a Harrier, to look like a Harrier, a Beagle to look like just that and an Otterhound to have its own identity, the role of each hound breed, together with the country hunted over, would always be the decider, not the breed title. For him, 'type' meant the conformation that brought success in hunting that particular quarry. I teased him about the differences between the Welsh Foxhound, the American Foxhound and the Fell Hound - all fox-hunters; he responded quite sensibly by stating their country was different so they were too - and he had a point, the Welsh Hound needing a thicker coat, the Fell Hound needing longer legs. The 'type' of such hounds was based however on purpose - their function. The hounds of the chase all developed because of what man required them to do! The French hound breeds demonstrate this very aptly, with discernible differences between the country hunted over, ranging from that of Normandy to that of the Vendeen region. But there was always little difference between those hounds in outline or profile; they were unmistakably scenthounds. 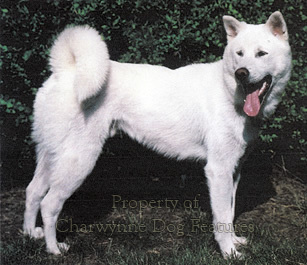 Their recognition as breeds was based on a pack rather than a 'bred-for' breed. 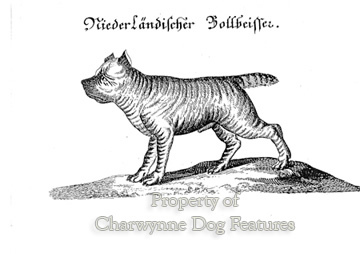 William Somervile, writing in 1742, gave a hint about the sheer variety available even then in the dog world: "The Chase I sing, Hounds, and their various Breed... And no less various Use..." But what makes a breed of dog a breed? Is it 'type' alone? The domestic dog produces breeds ranging in size from the giant Irish Wolfhound to the tiny Chihuahua, in coat from the heavily-coated Bergamasco to the non-coated Mexican Hairless Dog and in shape from the leggy Saluki to the nearly legless Dachshund. Such variations were originally initiated by function: the sighthounds needing the anatomy which allowed them to catch their prey using their speed; the scenthounds needing to have the physique to catch their quarry through stamina; the terrier breeds needing to be capable of entering underground burrows and the gundogs needing the physical qualities to hunt up game or retrieve shot game in all ground conditions. Not surprisingly therefore there are similarities between breeds within each of these groups. The Sloughi, the Greyhound and the Whippet have immediately recognisable similarities; the Foxhound, the Finnish Hound and the Hamiltonstovare look very much like each other; a liver and white Field Spaniel is easily confused with an English Springer and ear carriage is the principal physical difference between a Norwich and a Norfolk Terrier. The two breeds of Welsh Corgi are now, post tail-docking, very easily confused. How can you tell a Japanese Kishu from a Balinese Mountain Dog? Do the shepherd dogs of Holland, Belgium and Germany essentially have no other fundamental differences than coat-texture? 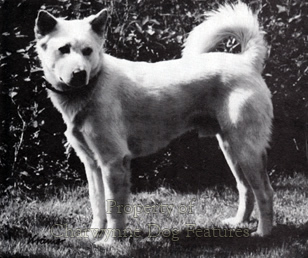 Is the Japanese Spitz actually a 'reduced' Samoyed from further north? What does make a breed a breed? Does breed-type have value? Or is it just a show-ring nicety? Breeds in the hound group provide a good example of how breed differences start. Foothounds tend to be small and slower moving, the hounds accompanying the mounted hunter have longer legs to enable them to possess pace. Hounds which pursued big game like boarhounds, tended to be bigger, higher on the leg and stronger jawed, as the Englische Dogge, the Deutsche Dogge/Great Dane, the Dogo Argentino and the Grand Griffon-Vendeen or the Grand Fauve de Bretagne each demonstrated. 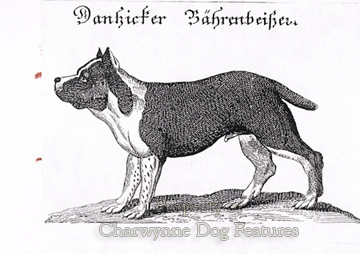 The killing hounds, the 'seizers', tended to be heavier, fiercer, weightier up front and wider-jawed, as their depictions as 'beissers', in medieval times, like the German Bullenbeisser, Niederlandischer and Danzigger varieties illustrate. The latter two groups, the heavy hounds, were invaluable before the invention of firearms and are nowadays, wrongly in my view, formally gathered into non-hound groupings, such as the Working Group, as categorized by our Kennel Club. Primitive man, not surprisingly, used primitive methods of hunting. He used fierce dogs either to drive panicking herds of animals over cliff edges into ravines or to wear down and then drag down the bigger game. His spear and his arrow lacked the range and the power to do this. Dogs in the wild hunt together in large packs but early man developed domesticated dogs strong enough to hunt in smaller numbers. Some became specialised in their skill at catching their prey through sheer speed; their type is perpetuated in our sighthound breeds of today. 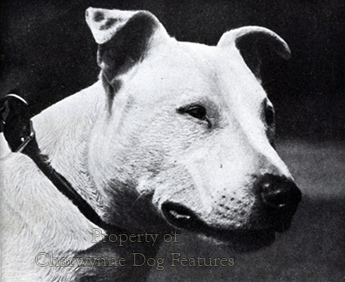 Their breed differences disappear when they are X-rayed and their bone structure is revealed. Others became renowned and valued because of their stamina, allied to their scenting powers. Here, physical type is of little value without scenting skill. Type is never restricted to physical form. The hunting mastiffs were esteemed for their ability at the kill, as many boar and stag hunt paintings indicate. For their successor breeds to lumber unathletically around a show ring is a travesty. This 'type' does not exemplify this type of breed! 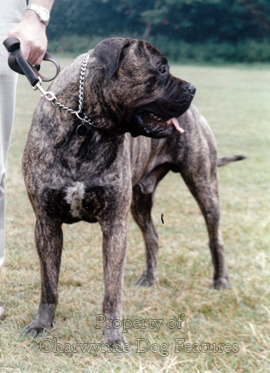 It is forgivable to look at the Mastiff in today's show rings, in the Working Group, and overlook its hound ancestry. In his celebrated book 'The Master of Game', written between 1406 and 1413 and the oldest English book on hunting, Edward, second Duke of York, started his eighteenth chapter with these words: "A mastiff is a manner of hound." Such a powerful hound was once deemed to pose a threat to the stags and boars of royal forests and lawfully made lame to stop it hunting. The breed of Mastiff we have today poses little threat to any stag or boar. This modern breed of Mastiff was re-created by 19th century English breeders using stock including the Great Dane, smooth St Bernard and Tibetan Mastiff. It now looks very different from its true ancestors. If it were to be bred in its correct historic mould, it would resemble a heavy hound, with excellent movement and great stamina. It should not have a massive wrinkled head, over-heavy excessive bone and disastrous movement. Such exaggerations ruin breed-type! There is a lesson here for Bullmastiff breeders. 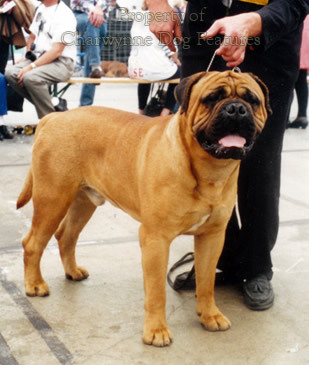 Bullmastiff breeders are wrong to look at type in the modern breed of Mastiff and say my breed should be 60% like that. They would also be wrong to look at type in the modern breed of Bulldog and say my breed should be 40% like that. The bull-baiting dogs were athletic and agile - or they didn't live long enough to breed! So what should a typical Bullmastiff look like? Whether it is modelled on the hunting mastiff or the Gamekeeper's Night-dog, its 19th century role, it must have: a really strong jaw, sound movement, great stamina, considerable substance and great strength, backed by immense determination. There are distinct tangible anatomical features that enable these qualities to be displayed in the breed. Functional type can manifest itself through breed-type, but not always specifically. Lack of type can spoil a specimen in any breed, and reduce its value. Dealing with the jaw first of all. A strong jaw has to have length as well as breadth. A gripping or pinning breed needs to be able to seize a good mouthful. A muzzle which is too short would be a handicap to a gripping breed. The broad-mouthed dogs should never be muzzle-less dogs. If you look at the dogs depicted in the prints of the bull-baiting rings they all have good muzzle length, unlike today's pedigree but untypical Bulldog. A broad mouth with some length reduces dentition problems, respiratory problems and whelping problems. A Bullmastiff with a muzzle-less, squashed-nosed face betrays all the work done by the dedicated pioneer breeders in the breed. Of course, a breed with 'bull' in its title should have a broad jaw, but never a muzzle-less jaw, a feature untypical of the breed. Type and shape of head are interdependent. This is ignored in every Breed Club in every country! Turning to breed-type in movement, it is fair to say, I believe, that the quality of movement in so many pedigree breeds is fast deteriorating and far too many contemporary judges simply do not know how to judge it. Good movement can soon disappear if ignorant judges reward faulty movement. Most terrier breeds in the show-ring seem now to have short upper arms and upright shoulders. This restricts their forward reach, length of stride and freedom of forequarter movement. This, combined with being strung up on too short a lead, produces a blur of front legs when on the move because the wretched dog has to take so many shortened steps to get anywhere. If any sporting breed is to have stamina it must have good forward reach and an effortless daisy-clipping front movement - a feature of its typiness. As far as hind movement is concerned, a great deal of comment is made in show critiques of bend of stifle and angle of hock. Below the hip however the bones of most breeds are similarly constructed. It is the angle the pelvis makes with the spine wherein breed differences arise. The sighthounds have a slope of around 60 degrees and a low set of tail because they have to get their hindlegs as far forward as possible to achieve stride length and pace. The terriers have a slope of only around 10 degrees because their breeders are seeking a high set of tail. This gives them a short rear stride, with characteristic movement. The scenthounds probably need a pelvic slope of around 30 degrees to allow length of rear stride and a balanced harmonious movement. Some of their breed standards however, the Beagle's and the Hamiltonstovare's for example, ask for a tail set high; a tail set too high will inevitably result in a stilted terrier-like hind movement untypical of the breed. 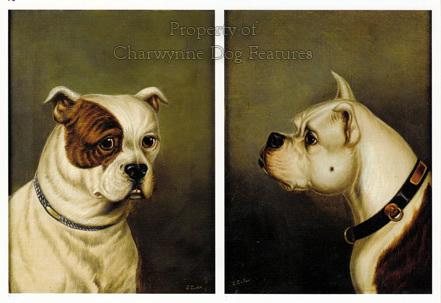 At the end of the last century, the pursuit of absurdly barrel-chested rib cages by misguided Bulldog breeders, led to 'out at elbow' becoming almost a breed feature. It has taken a long time to put that right. The ratio of chest depth to its width is now known to be a factor in the incidence of bloat in dogs. Lung-room comes from a balance between girth of chest and length of rib cage. The breed standard drawn up by the British Bullmastiff League at its inception contained this valuable phrase: "...ribs arched, deep and well set back to hips"; today's breed standard does not even mention the ribs. The Bullmastiff's distant ancestors needed to gallop; to do so they needed lungroom to sustain the gallop but also no interference with activity from being too short coupled. The size of the gap between the last or rearmost rib and the leading edge of the dog's thigh is a crucial one; too little allows explosive power but no endurance, too much can produce a weak back through lack of support. A hand's width is perhaps ideal in a hunting mastiff. The Ancient Greeks knew the value of length of back in dogs designed to gallop; Arrian and Xenophon linking it with spirit and pace. There would be value in the Bullmastiff clubs conducting a study on the distance between the point of shoulder and the point of buttock in their dogs. This measurement, which should be slightly more than the height of the dog, will always be linked to the compactness of a dog and its ability to move impressively, with strength and purpose. This relates to breed-type too. Substance and great strength come from correct construction and powerful muscular development, very different from a fat dog with heavy bone. There is evidence that puppies bred and fed for 'great bone' are more prone to hip dysplasia. Hip and elbow dysplasia, osteosarcoma and cervical vertebral malformation appear to be more prevalent in the heavier breeds, most of whom are far heavier than their ancestors. Bone disorders in the pedigree dog are becoming more frequent in incidence. Massive round bone is not strong bone; the Foxhound breeders found this to their cost one hundred years ago when the so-called 'shorthorn' period did enormous damage to breeding stock. Flat bone, produced naturally, has long been found to be stronger -- ask any racehorse owner! Why breed large dogs with heavy round bone when such a feature is neither typical nor healthy? Why not rely on historic type? But why breed dogs in the 21st century for a lost function? The answer is that function gave us breed type, with physical soundness. Look at just some of the pedigree breeds that can no longer carry out their original role: Bull Terriers, Bulldogs, St Bernards, show Basset Hounds, Scottish Terriers, Rough Collies and Dachshunds. Once they were bred away from function they all lost their true type. 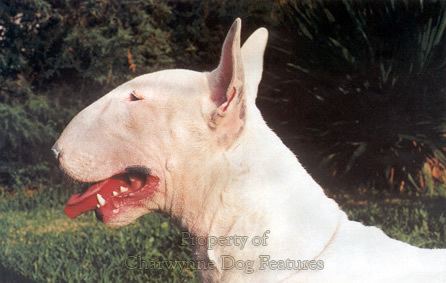 In his informative book "All About the Bull Terrier", the late Tom Horner described the four types which can surface in this breed: the Bull, the Terrier, the Dalmatian and the Middle of the Road type, going on to refer to unacceptable variations such as the Borzoi, Corgi and Fox Terrier types. Most pedigree breeds are a blend of blood, acquired in the pursuit of function. The skill of the breeder lies in getting the balance of ancestor blood correct and appropriate; type is never a constant, it has to be consciously and constantly resought. 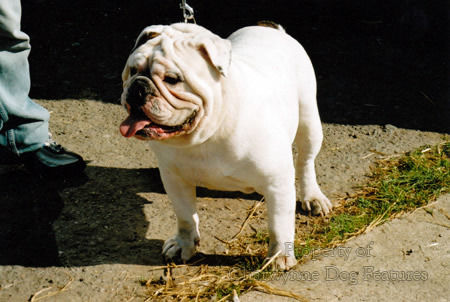 Breeders of British breeds, mainly those competing in the show ring, are sometimes accused abroad of seeking exaggeration, exaggeration to a degree that is harmful and untypical. Those perpetuating our native breeds must remember the function for which that particular breed was developed, whether that function has lapsed or not. Only then can real genuine historically correct type be preserved. Every breeder of one of our native breeds has a special duty to safeguard its future; we must never let breeders from foreign countries change type or dictate what our breeds should look like. In his informative book "The Theory and Practice of Breeding to Type", published by 'Our Dogs' eighty years ago, CJ Davies concluded: "...animals nearest to the 'correct type' are those best adapted for the work which they are supposed to perform;" it is so important to remember this when assessing a dog or planning a litter. Breeders and judges, think hard before you make decisions - the future of all our magnificent breeds of dog are in your hands.